Use other vegetables that you have in the refrigerator, such as green or red bell peppers, or cooked corn. Mix eggs, milk and seasonings in a bowl. Heat oil in skillet over medium-high heat (350 degrees in an electric skillet). Stir in the eggs and cook until firm. Warm the tortillas on a griddle, or wrap in foil and heat in the oven. Warm the refried beans in a separate pan. On each tortilla, layer 1/4 of refried beans, eggs, cheese, and tomato. Roll the burrito, cut in half, and enjoy! 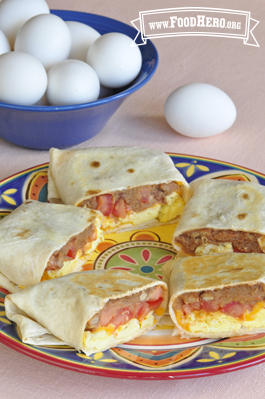 1 Comments for "Breakfast Burritos"
These are great! I added a little sausage into them and the flavor was fantastic.